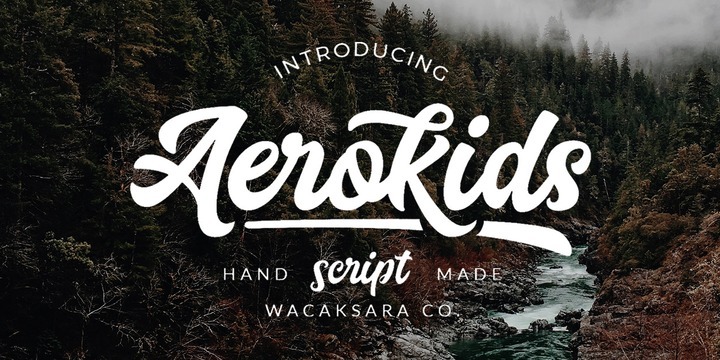 Aerokids is a very classy modern script created by Aliv Pandu together with Hamam Jauhari and published by Wacaksara co which has strong styles and dramatic movement. It’s allowing you to create beautiful hand-made typography in an instant. Available in some usefull OpenType features, it is suitable for logo, poster, sign painting, pakaging, wedding etc. Aerokids is here to help! A font description published on Monday, December 12th, 2016 in Aliv Pandu, Fonts, Hamam Jauhari, Wacaksara co by Alexandra that has 3,625 views.